This trail is one-way on the downhill from Hog Back down to West Branch. 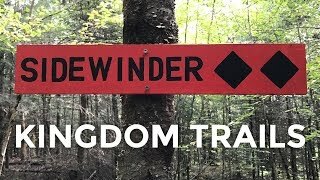 If there is one trail you've heard of in the Kingdom, it's probably Sidewinder. A huge gully run with massive walls makes for a fast and fun rollercoaster. Not for the faint of heart. Mar 8, 2017: Thank you Kingdom Trail Landowners!! !